I have shown both front and back covers. 1937--- I have never seen this map. Does it exist? wpf@mnsi.net 1938 ---maps changed in a big way---the larger size provided the oportunity to combine Ontario, Quebec and the Maritimes in one package.This would be the beginning of the end for for the Boy and Slate, just as he took on a new look for the '38 cover. In late 1938 National Oil Refining Co. sold the business to Canadian interests. A new look was in the makings------- Have you seen a "Canadian" Boy and Slate map dispenser or sign? I'd like to know. wpf@mnsi.net U.S. versions do exist. Once again "all Canadian owned" , Canadian Oil Companies Limited began the task of turning the company arround and expanding. A new look was an early priority,but consumer loyalty and product recognition could not be overlooked. En-Ar-Co and White Rose had a unblemished name and a vast consumer base. 1940 ---map (left) shows how the company combined the familiar and trusted Boy and Slate, albeit downsized, and the new White Rose logo. Being the war years, I feel the same map was issued through 1944. Fantastic colours, graphics and inside ads made this series truly beautiful.Again one map covered Ontario,Quebec and the Maritimes 1945---another new logo,this time with "White Rose" lettering encircling the "rose". Sadly the Boy and Slate has disappeared from the roadmaps. 1947-'51 --- Back to two roadmaps and the first slogan on their maps,"The Pick Of Them All"
I have a (cardboard) map wall display with the new encircled logo. the new homogenization process (which began in 1952). Again I have included front and back views as some important things are happening here. 1954----"Happy Motoring" is joined by a new slogan--"Performance Beyond Compare" . Man./Sask./Alb./B.C. now have their own map.The new packaging is shown with the "Ultra"
1955---Return of the "The Pick Of Them All" slogan. not new,the rear panel shows the new permanent, metal 'Charg-O-Plate'. A totally new design arrives! 1957--- introduces the new yellow and green roadmaps. "The Pick Of Them All" dominates. "THE MAN WHO KNOWS BUYS WHITE ROSE". Alberta and The Maritimes are represented too. The new yellow /white Charg-O Plate is shown (plastic). I suspect these were used until 1963. A city map of Hamilton leads me to believe there was also a Toronto and Quebec City. Alberta/British Columbia and Quebec likely exist as well. The back panel shows the new station design and "The New TOTAL Gasolines"
Just guessing, but I think the '64 map was used till "the end" in '67s. track down the publishing date . 1967--- Canadian 'Centennial' map folder and promotional booklet came to me with the '64 copywritten map in the photo above. 1967 would spell the end of White Rose !!!! 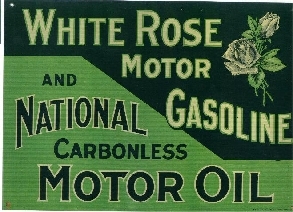 Ironically, the first map in 1935 mentioned the "En-Ar-Co Touring Bureau ", and the final year used "White Rose Touring Service".No mention was made of either division in the years between. Where were you in 1967? the last of these collectibles.